On Christmas Eve the children laid out the traditional holly branches on the window ledges…” Jane Austen: A Life, Claire Tomalin, p. 4. Christmas decorations during the Regency era were relatively simple compared to today’s standards, or even Victorian standards, when Christmas trees and wrapped packages made major appearances in common households. Evergreen plants that bore fruit in the winter season, such as holly, mistletoe, rosemary, bay, laurel, box, yew, and fir have been popular British holiday decorations for centuries. Their meaning as symbols of everlasting life is derived from pagan days (Sciencing). It is uncertain when these evergreens began to be used as Christmas decorations, but carols mentioning the holly and ivy appeared before the 15th century. In addition to the holly and ivy, this early 17th century carol describes Christmas customs that are still popular. And ever more be merry. Specimens of Old Christmas Carols: Selected from Manuscripts and Printed Books, Volume 4, London: Printed for the Percy Society. By T. Richards, for the Executors of the late C. Richards, 100, St. Martin’s Lane. 1841. “Ceremony Upon Candlemas Eve,” Hesperides, or, The works both humane & divine of Robert Herrick, Esq. London: Printed for John Williams and Francis Eglesfield, 1648. The History of Goody Little Two Shoes was one of the moral lesson books that Jane Austen owned as a child. These seem to have been popular in the Georgian era. Another book with moral lessons came out two years after her death. 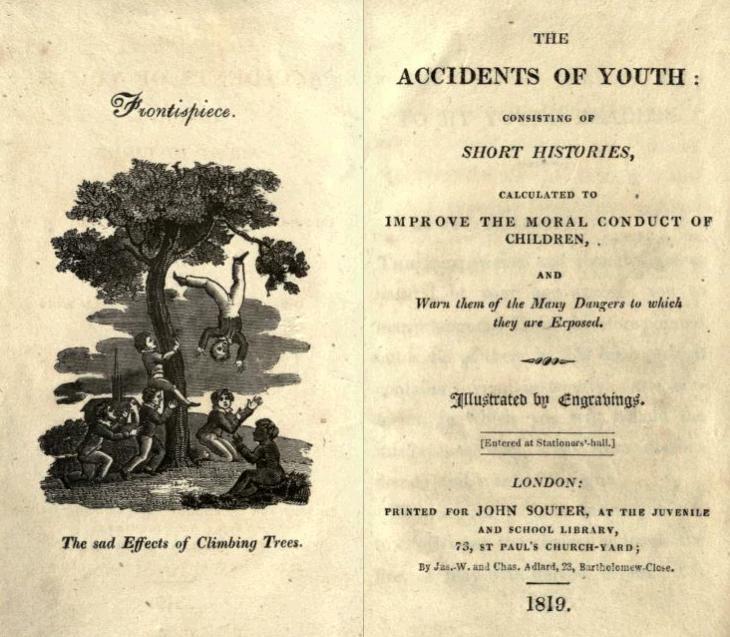 Entitled The Accidents of Youth, its tales were meant to warn children of risky behaviors and improve their moral conduct. The tales would have been scary enough to make me think twice as a child. I love the Internet Archive, which allows you to read the books virtually intact, with illustrations and original font type. The only thing you can’t do is hold the book or feel the thickness of the pages. Interestingly, these accidents beset children today, especially those left to their own devices in the countryside. One young man aims at a bird with a slingshot and kills his mother, a horrific tale. Another’s hair is set on fire by a candle. Kitchen accidents were quite common. After death from childbirth, kitchen fires killed more women than other accidents combined. In these stories children are warned of the dangers of hot kettles and catching one’s clothes on fire from coming too close to a fireplace. 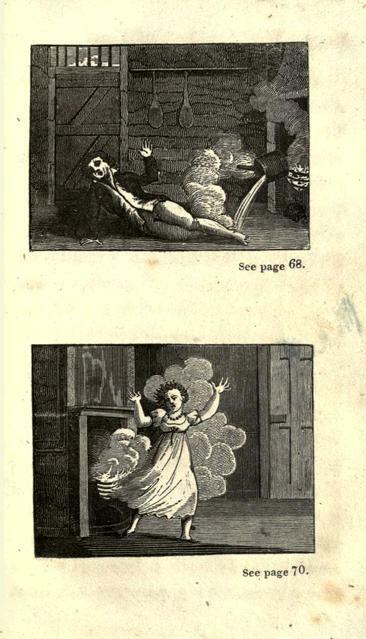 In the first image, a cast iron pot, hanging directly over the fire on an iron hook tips over, burning the child. 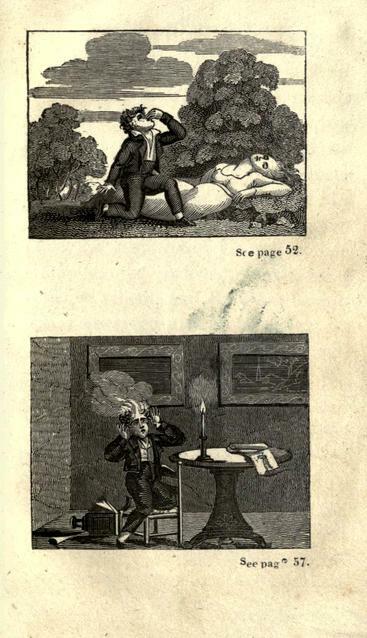 Billowing skirts caught fire in fireplaces, as the second image attests. 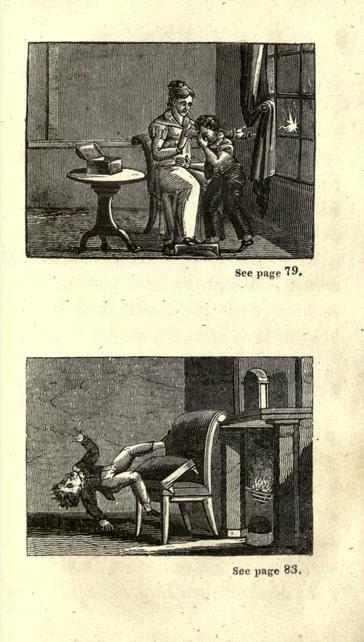 The final image in this post shows the danger of a broken glass window and a young boy falling from furniture that he had rearranged at play. Another, earlier book entitled The Blossoms of Morality and published in 1806, concentrates on the instruction of young ladies and gentlemen”. The stories include “Juvenile tyranny conquered” and “The melancholy effects of pride”. One can imagine that, after reading Fordyce’s Sermons to his young children, Mr. Collins would have picked up these books to read to his children. I wonder how long the concentration of today’s youth would have lasted when listening to these morality tales. One nanosecond? I think not. Fabulous Dr. Lucy Worsley discusses the Regency Era in these videos. Wonderful. What did ladies do in the morning 200 years ago? Why, write letters and draw and paint, of course. A genteel lady knew all three arts and achieved them with varying skills. This delightful La Belle Assemblee print details how a well-dressed woman would look at her work table. 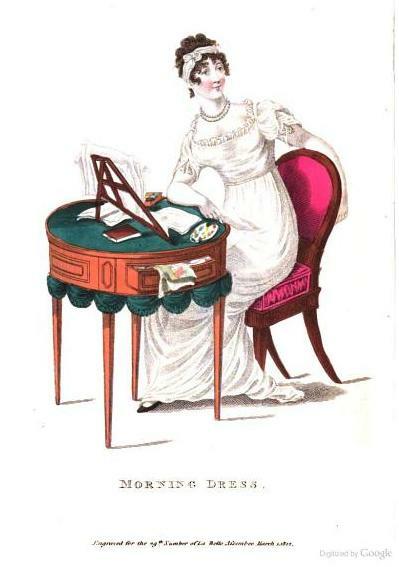 This young Regency miss works like me, btw: with everything out and cluttering surfaces. 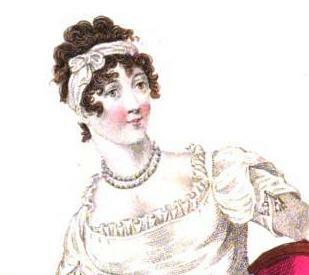 Detail of hair and bodice, La Belle Assemblee, March 1812. Note the lovely bandeau, the ringlets framing the face, and the relatively high neckline with ruff. 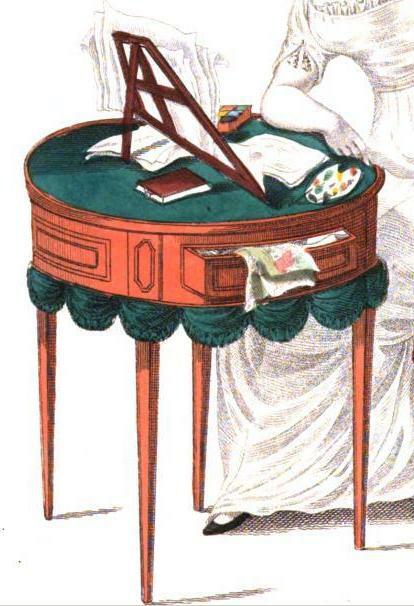 Detail of ladies round worktable with drawer. 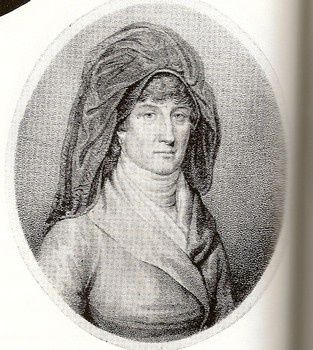 La Belle Assemblee, March 1812. 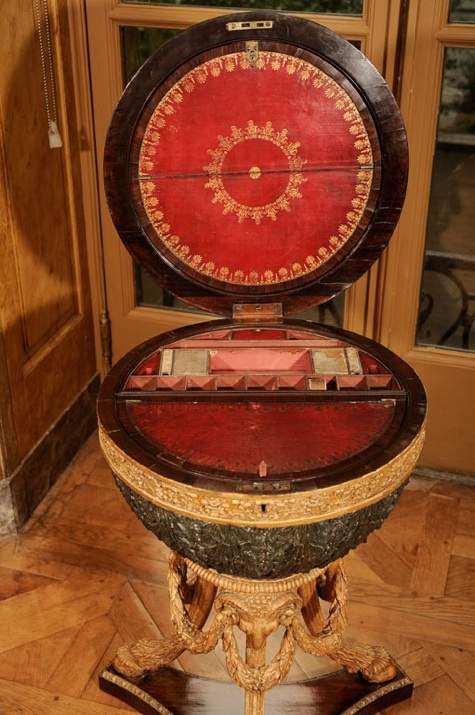 This one most likely had a top and decorative swaths made of green baize, which prevented sliding. These small and elegant worktables were portable and could be easily carried near a light source or fireplace, or stashed against a wall when company came. They varied, some coming with a variety of compartments – some hidden – that contained writing and painting supplies. 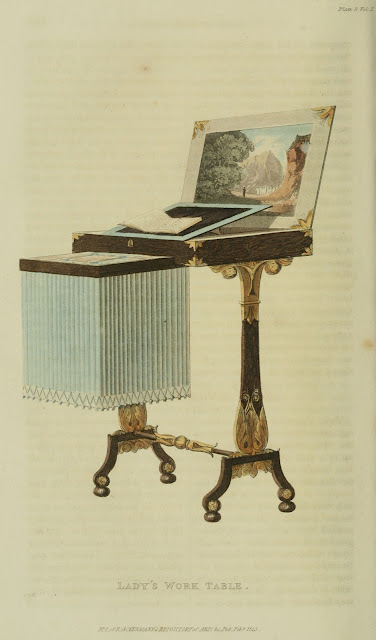 Many had book stands for reading, others had drawers that contained paper or embroidery threads and sewing supplies. This was a very elegant and expensive work table for a rich lady. 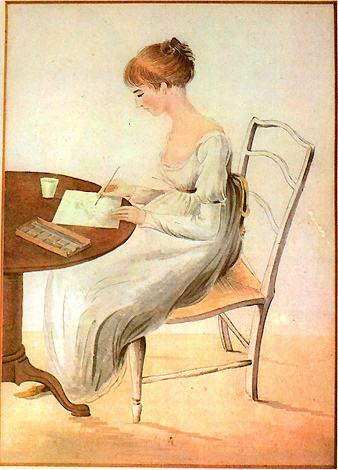 Jane Austen’s niece, Fanny Knight, paints watercolors on a regular table. 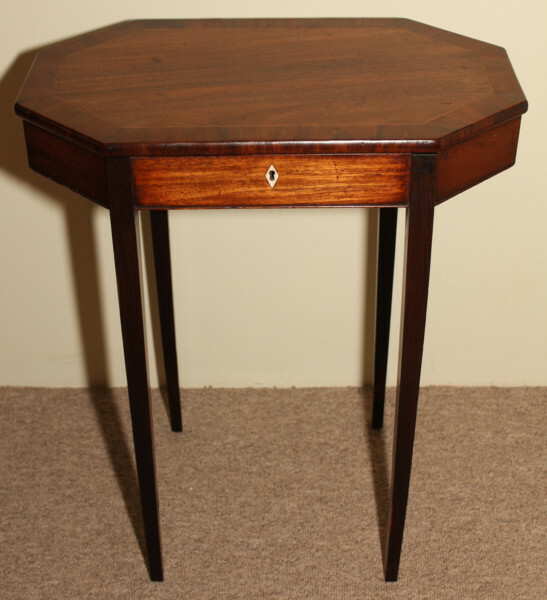 This rather plain octagonal worktable has four legs instead of the pedestal on Fanny Knight’s table. As you can see, work tables varied in design and construction. 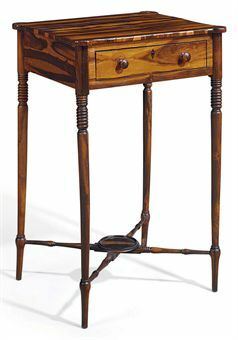 This simpler and smaller cocuswood work table suited a lady’s purpose as well as a fancier one, but it has fewer compartments. Early 19th century regency cocuswood work table with a rectangular top and single drawer.The turned legs are joined by a turned stretcher with circular platform, with paper label to underside inscribed purchased by ABM. A few months ago I featured a short video of an 18th century French mechanical worktable, which showed how the hidden mechanisms worked and how easily the table could be moved from place to place. Click on this link to view it. Note: The blue links are mine: the green links are ads placed here by WordPress. I make no money from this blog. Inquiring readers: Paul Emanuelli, author of Avon Street, has contributed a post for this blog before about the City of Bath as a Character. He has graciously sent in an article about crime and an incident involving Jane Austen’s aunt, Mrs James Leigh-Perrot. Paul writes about Bath in his own blog, unpublishedwriterblog. It is well worth a visit! Apart from the Bow Street Runners in London there was no organised police force in 18th Century England. The capture and prosecution of criminals was largely left to their victims to deal with. Every parish was obliged to have one or two constables, but they were unpaid volunteers working only in their spare time. A victim of crime who wanted a constable to track down and arrest the perpetrator was expected to pay the expenses of their doing so. Sometimes victims of crime hired a thief-taker to pursue the wrong-doer. Again, they were private individuals working much like latter day bounty hunters. 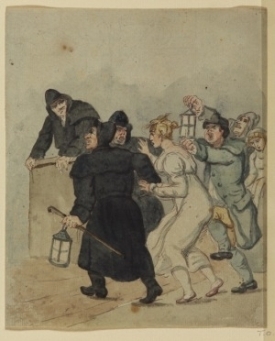 Sometimes, thief-takers would act as go-betweens, negotiating the return of stolen goods for a fee. Many though were corrupt, actually initiating and organising the original theft in order to claim the reward for the return of goods, or extorting protection money from the criminals they were supposed to catch. For the most part, unless a criminal was “caught in the act” (probably) by their intended victim it was unlikely they would be brought to justice. In the absence of a police force, the maintenance of “Law and Order” therefore came to depend more on deterrence rather than apprehension and the harshest penalty of all came to cover more and more crimes. In 1799 there were 200 offences that carried the death penalty, including the theft of items with a monetary value that exceeded five shillings. In practice, judges and juries often recognised the barbarity of the punishment in relation to the crime. Juries might determine that goods were over-priced and bring their value down below the five shilling threshold. Defendants might claim “benefit of clergy” which by virtue of stating religious belief and reading out an oath allowed the judge to exercise leniency. In other cases the Government could review the sentence. 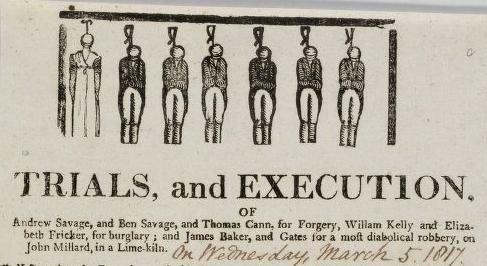 Between 1770 and 1830, 35,000 death sentences were handed down in England and Wales, but only 7000 executions were actually carried out. 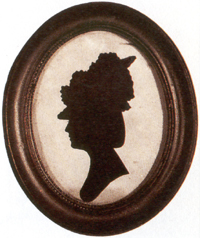 On the 8th August 1799, Jane Leigh-Perrot was accused of stealing a card of white lace from a millinery shop in Bath. 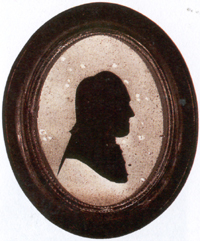 The Leigh-Perrots, a wealthy couple, were Jane Austen’s mother’s brother and sister-in-law (Jane’s Uncle and Aunt). The white lace valued at £1 was found in Mrs Leigh-Perrot’s possession together with a card of black lace that she had bought and paid for from the same shop. Mrs Leigh-Perrot denied stealing the lace, saying that the sales clerk must have given it her by mistake when he handed over her purchase. She was nevertheless arrested on a charge of “grand theft” and the lace she was said to have stolen was worth four times the five shillings that carried the death sentence. In practice it was unlikely (given her standing) that if she had been found guilty she would have been sentenced to death. The alternatives, however, included branding or transportation to the Australian Colonies with the prospect of forced labour for 14 years. 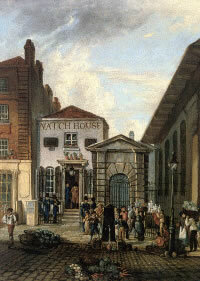 Jane Leigh-Perrot was refused bail and committed to prison on the sworn depositions of the shopkeeper. Due to her wealth, social standing and age she was allowed to stay in the house of the prison keeper, Mr Scadding, at the Somerset County Gaol in Ilchester, rather than being kept in a cell. Mrs Leigh-Perrot still wrote though that she suffered ‘Vulgarity, Dirt, Noise from morning till night’. 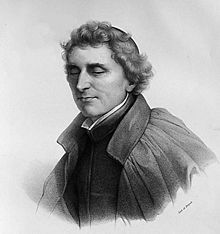 James Leigh-Perrot insisted on remaining with her in prison. This image of a bourdaloue might be somewhat confusing to the uninitiated. 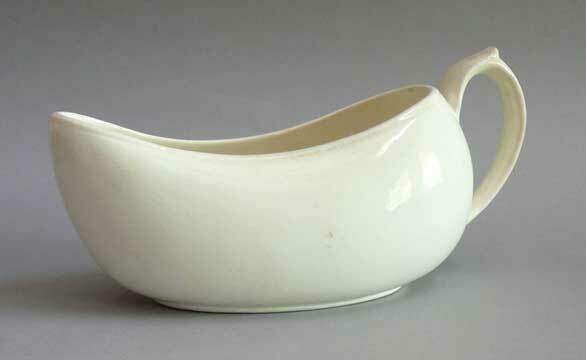 Could this small and elegant vessel be a gravy boat? Or a blood-letting container? This image by Francois Boucher says it all. A fully dressed lady is relieving herself into an object called the bourdaloue or bourdalou, careful not to soil her skirts. Her maid, no doubt, stands nearby, waiting to receive the small chamber pot in order to empty it. The lady (or woman of ill repute) is in a public place – a theatre or tavern, perhaps – but certainly not a church. Wherever she is, the place has no public toilet. And so she must relieve herself standing up, taking care not to soil her skirt and petticoats. The vessel was oblong, rectangular, or oval in shape. A slightly raised lip at one end and a handle at the other allowed the woman to relieve herself from a squatting or standing position. The edges curved inward to avoid hurting her tenderest parts. Sevres bourdaloue, with medallion depicting a scene from Watteau, blue lapis and framed in gold leaf. 1892. 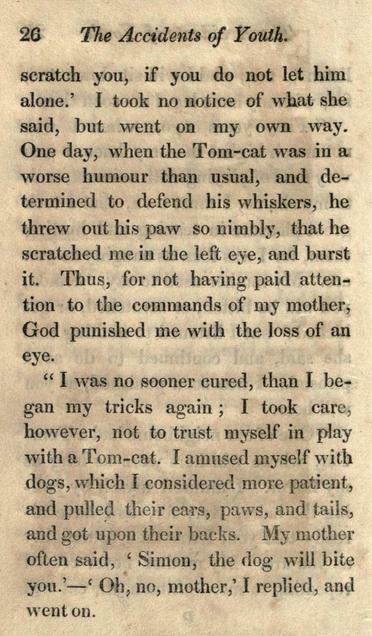 It is a little hard to distinguish truth from fiction, so I am a bit skeptical about this apocryphal tale. Were the priest’s sermons in the early 18th century so truly awe-inspiring that a lady would squat in her pew, however discreetly, to relieve herself in front of her family and other parishioners so as not to miss a word? In truth it was her maid who brought the vessel in, for bourdaloues were compact and came with a cover. When a lady had to relieve herself she would, I imagine, retreat discreetly to a private corner of a tall pew or to a back or side room in the church. 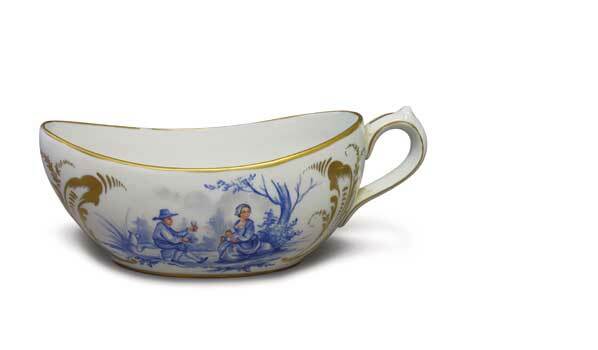 Her maid would then hand the vessel over to her mistress, who took care not to spill any liquid on her skirts. When the lady was finished, she would hand the bourdaloue to her maid to empty its contents. When attending a play or opera at the theatre, I imagine she would again retreat to a darker more private corner of the box to urinate. Designed only for women, these bourdalous are quite beautiful. Made of faience or porcelain, they are decorated with flowers or painted scenes. Many are gilded. 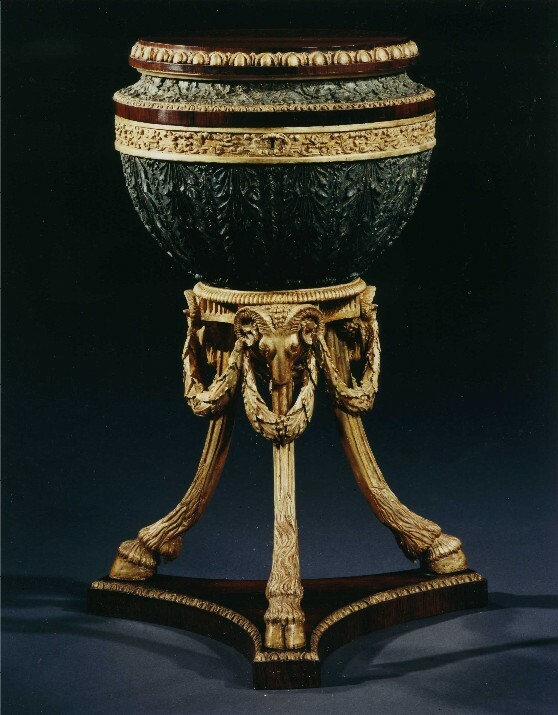 The portable pots, or coach pots as they were known in England, could be decorated inside as well. 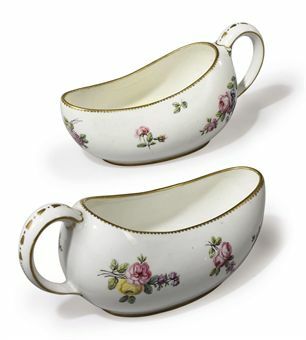 They were quite small and compact, designed for travel, which made it easy to carry them and pack them for coach trips. They were also taken to long banquets, where ladies would scurry behind curtains when they needed to go. 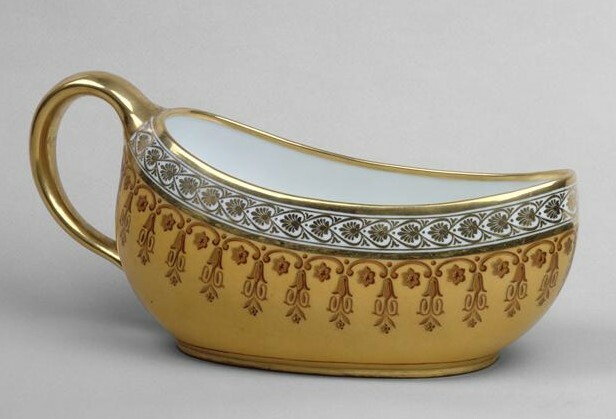 Bourdalou made in France c. 1840. It has an engraved crest and a leather case to contain it. 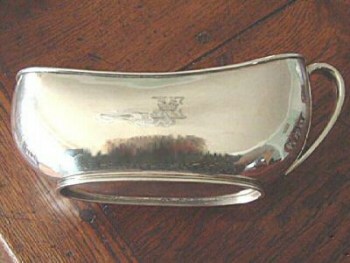 The silver bourdalou is a small urinary receptacle for female use, of compressed eliptical shape and generally made of porcelaine or earthenware, but also made occasionally of silver. Its front end has an incurved rim and, usually, stands on a simple foot ring with a simple loop handle. Also known as a coach pot in England. Bourdaloues were used throughout the 18th and for most of the 19th century. As water closets began to be built inside homes and buildings, the use of these chamber pots began to be reduced dramatically. Plain bourdaloue made of creamware. The shape is quite elegant. 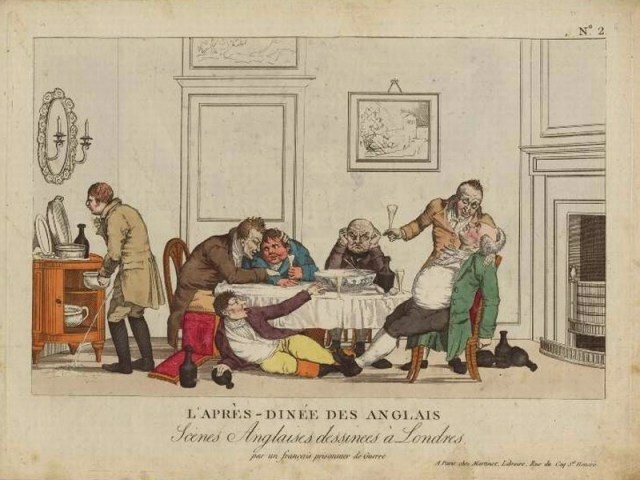 Gentlemen had it a little easier, although this satiric French cartoon, which I have shown before, depicts the disgust that Frenchmen felt towards Englishmen who freely pissed in a pot in the dining room. In this instance, the man misses the chamber pot and hits the floor. There seems to be a lack of modesty among these men, which largely holds true today. 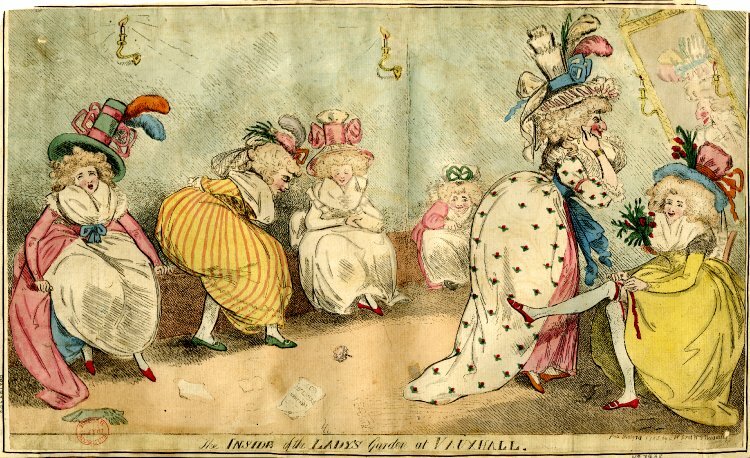 Modesty is also lacking in this cartoon of ladies relieving themselves inside a public restroom at Vauxhall Gardens. Four are arrayed on a long latrine against the wall. One lady is refreshing her make up and another is tightening her garter. If such scenes were common for upper class women in public spaces, perhaps many felt no modesty relieving themselves in church as well. The Inside of the Lady’s Garden at Vauxhall, 1788 by SW Fores. 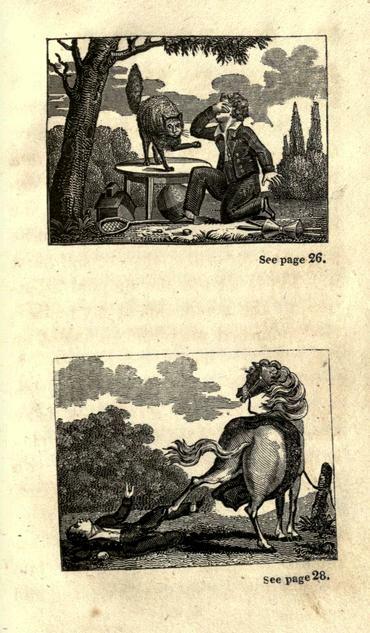 Image @British Library. 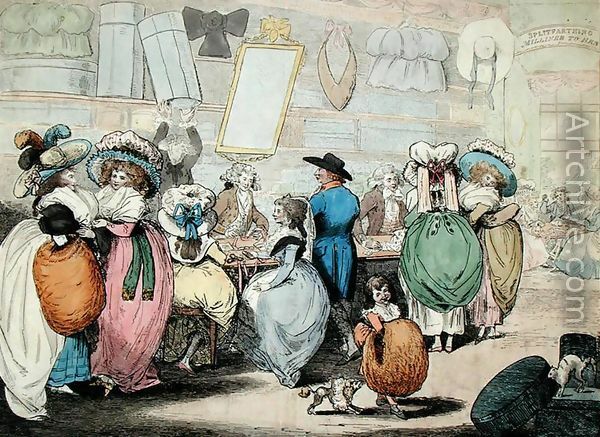 The interior of a ladies’ cloak-room. Against the wall on two sides of the room is a bench forming a latrine on which four fashionably dressed ladies are seated. On the right a woman in profile to the right, resembling Lady Archer, applies paint to her cheeks before a mirror lit by two candles. A young woman seated beside her on the extreme right ties up her garter.